Peace Train is technically not a nasheed (Islamic song), as it was written before Cat Stevens converted to Islam. The lyrics are however positive and the song was later re-sang as a nasheed by Zain Bhikha, and Yusuf himself. Yusuf is still touring with this track despite being released in 1971 – that’s got to tell us something about the strength of the song! His next tour will be in South Africa on November 8th 2017. Yusuf / Cat has released many different versions of this track over the years, from the original to the blues (watch him sing both). There have also been a number of cover versions recorded by various artists. So, why am I referring to him by two names? His birth name was Steven Demetre Georgiou, and he sang under the artist name ‘Cat Stevens’ back in the 70s. He was a well-known mainstream musician, loved by many around the world. In 1977, Steven went through a near drowning experience, which prompt his search for religion. Interestingly Steven was given a copy of the Quran as a birthday present by his brother, who had converted to Judaism. After reading the book, Steven decided to embrace Islam. The following year he changed his name from Steven Demetre Georgiou to Yusuf Islam, inspired by the story of Yusuf (Joseph) in the Quran. Yusuf then left music in order to focus on his faith. He has done a huge amount of work for charities, and won a number of humanitarian awards including the World Award (2003), Man of Peace award (2004) and the Honorary Award of the German Sustainability Award (2009). 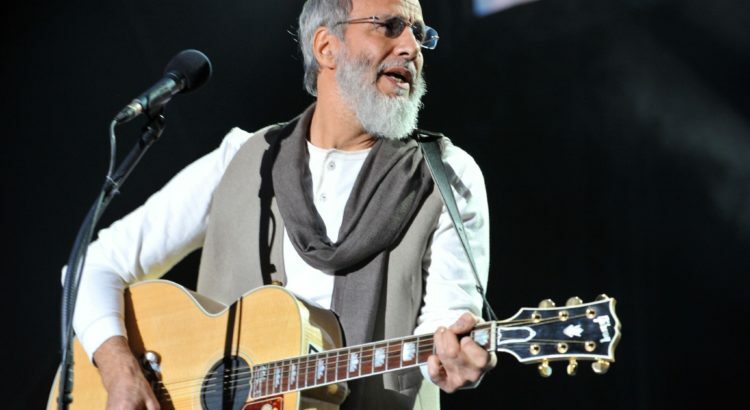 In recent years Yusuf has come back to music, singing under the name ‘Yusuf / Cat Stevens’. His new album is due to release on 15th September 2017. Why did Yusuf Islam return to music? In his view music and Islam can go hand in hand. He often speaks about the Guitar and it’s links to Islamic civilisation. Yusuf has now written a book titled ‘Why I still carry a guitar‘ as a response to critics who do not support his decision – It has great reviews, worth a read! There are a number of videos related to this track – it was hard to pick one! Here is a live performance from 2016, after a long break from music. The format of this site is to go through the lyrics of Islamic music, calling out references to Quran and Hadith. This was not originally written as a nasheed, however the lyrics are brilliant and full of reflection. Let’s take a look. Despite what some may think, smiling is actually encouraged in Islam. It was common practice of the prophet (pbuh) to smile. There are many sects of different religious groups around the world – Christians, Jews and Muslims have split into sects. Islam teaches not to divide the religion, and rather unite as one. God tells Muhammed (pbuh) not to associate with those who break into sects. The idea of peace ruling over corruption is called out in the Quran. Doing good gives you good – the perfect circle. It may be natural to dislike someone at times, however the Quran teaches that these feels should be controlled. This song was released 16 years before I was born, yet I love it! You can find my rating below. Please leave your own rating using the star system and comment box below.